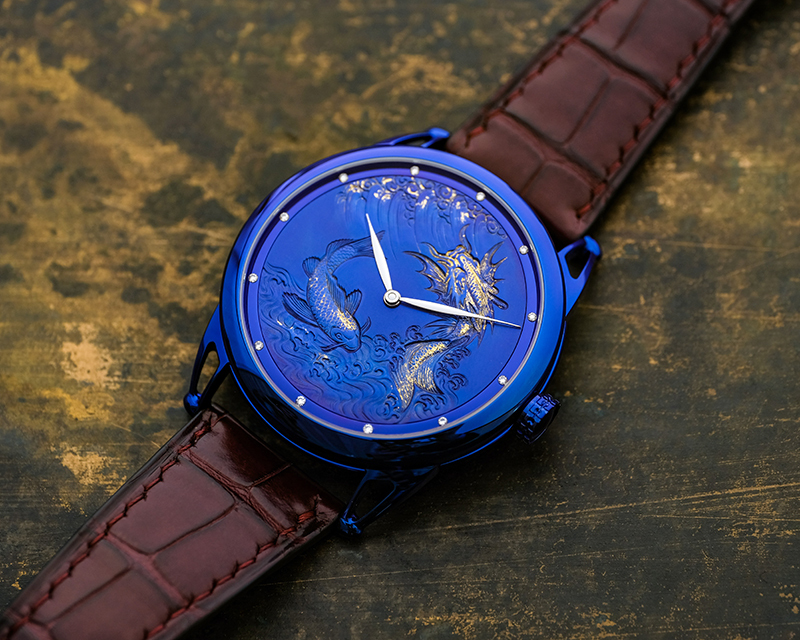 MESOAMERICAN art and a night sky scene that can be personalized; these are just a couple of themes De Bethune has dabbled with in the past. In its latest offering though, the watchmaker has yet again looked to the Far East as it reprises, albeit in a different manner, its DB25 Imperial Fountain collection. Released in 2013 — two years earlier than the DB25 Quetzalcoatl and five years ahead of the DB25 Starry Varius (the pieces referenced above) — the DB25 Imperial Fountain came in only 12 examples. 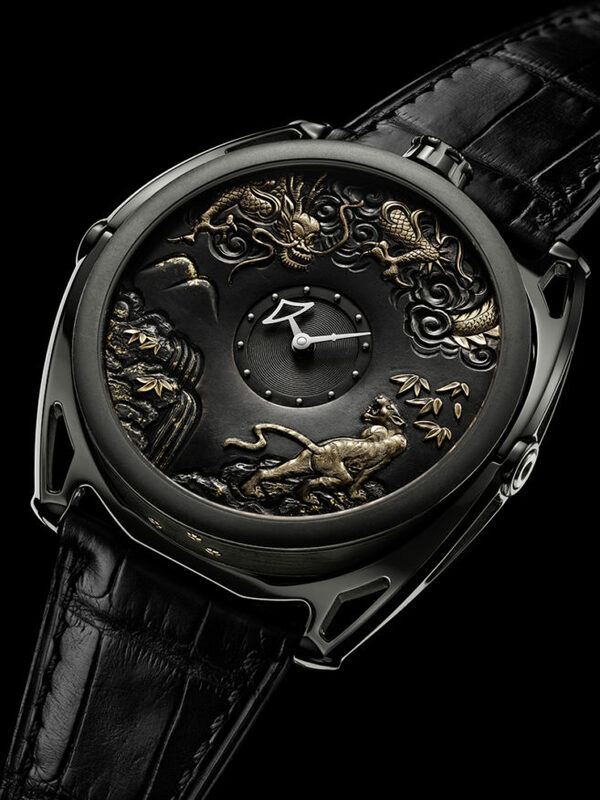 Each timepiece depicts on its dial an animal head figure from the Chinese zodiac. The hand-engraved bas relief sculptures are replicas of the figures adorning the water clock at the Old Summer Palace in Beijing. 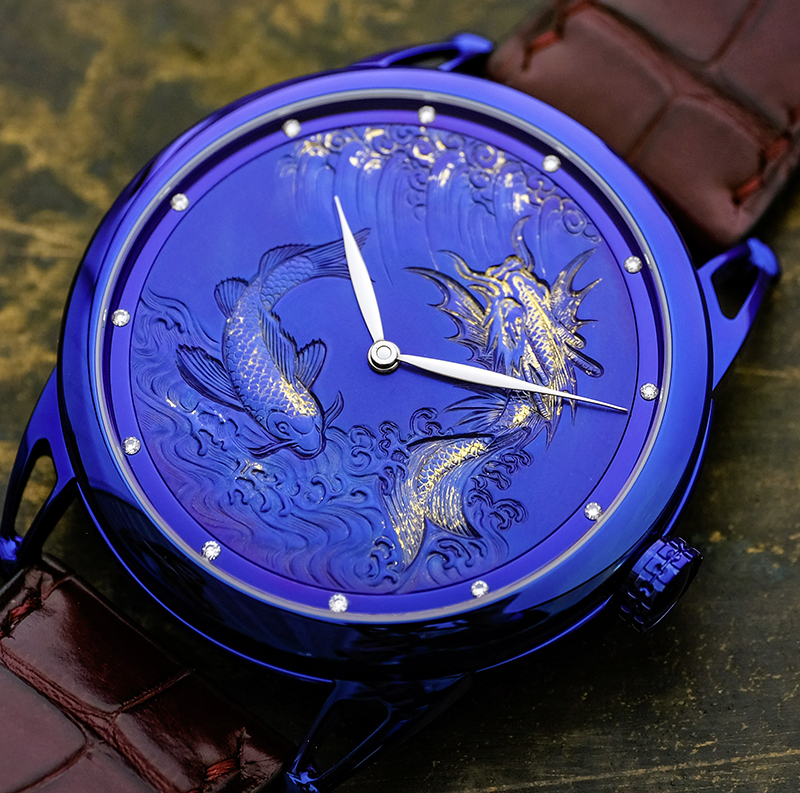 De Bethune’s new two-model release, christened Maestri’Art Collection, also draws inspiration from Asia — Japan and China, to be specific. 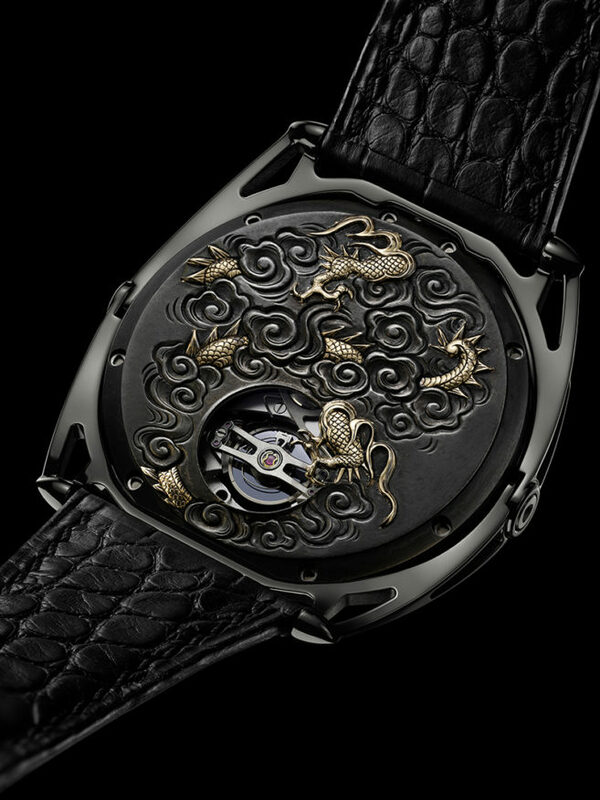 The Asian influence on the latest watches, however, is not merely skin-deep. 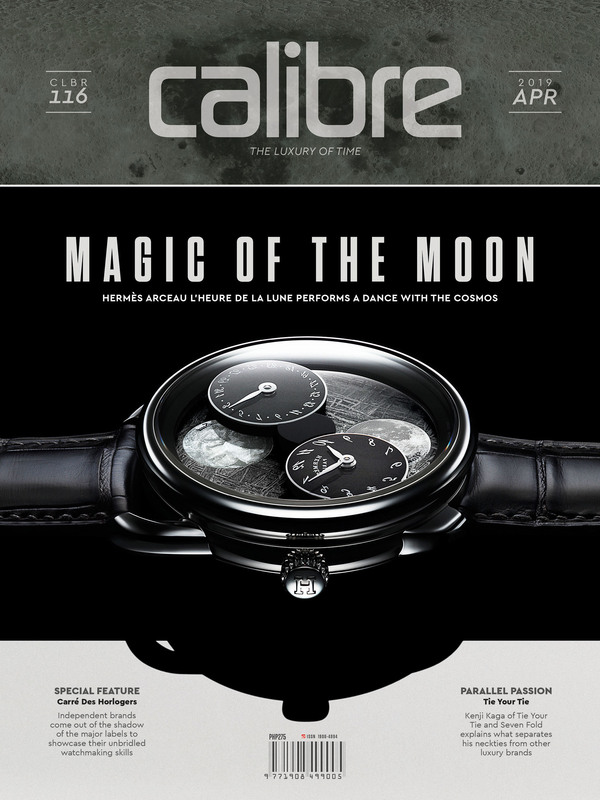 The first is fashioned from a type of metal alloy that Bethune says is little known in the West, the other is an exercise in artisanal techniques as applied on high-tech titanium. In the Maestri’Art 1 De Bethune re-imagines the tsuba, the hand guard of a Japanese sword. It is that piece of metal, often round, that’s mounted perpendicularly at the junction where the blade meets the handle. It’s usually made of iron, although silver and copper were used, too. And then there were the variety of copper alloys — brass, bronze and even Japanese ones like shakudo and shibuichi — that have found their way into a tsuba. At times sparse, at times heavily decorated with engravings and gold inlays, a tsuba declares the social status and philosophy of the sword’s owner. Which is exactly what the Maestri’Art 1 communicates, too. The watch’s 43-millimeter case has a dial that isn’t so much a dial but could actually pass for a scaled down tsuba. 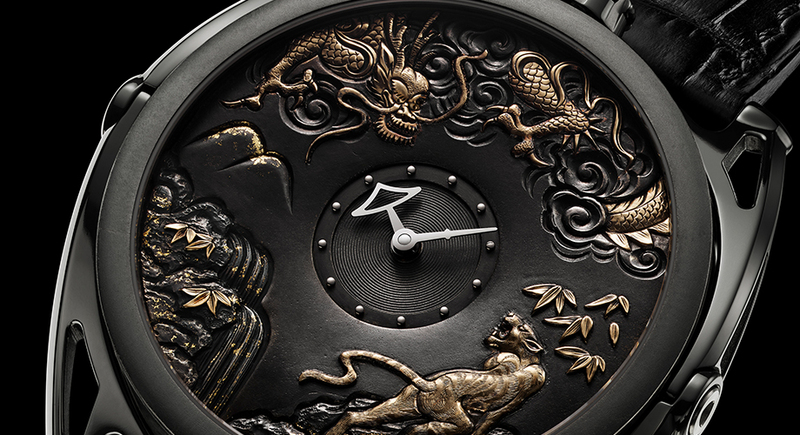 The case and the dial have textured surfaces in a matte black finish, with the majority of the dial’s landscape engraved (a bit “crudely” to approximate the tools used during the era in which a sword is actually indispensable) with a dragon, a tiger, clouds and Japanese foliage. Gold inlays accentuate the key elements of the images depicted. At the center of the dial resides the, well, watch’s true dial, the one on which hour markers and two hands reside. Despite the diminutive dimensions of the markers and hands though, they remain legible as they come in white, setting them off against the black backdrop. Powering the Maestri’Art 1 is De Bethune’s AutoV2 self-winding calibre that spins at 28,800vph, has 29 jewels and a power reserve of 60 hours. It also boasts of De Bethune’s patented balance wheel and a rotor made from titanium and tungsten alloy. Only the balance wheel mechanism peeks through the caseback as more engravings are lavished on this space. If the Maestri’Art I leans toward Japanese aesthetics, the Maestri’Art II looks to Chinese iconography — koi carp in particular, which Chinese farmers in the 17th century raised in their rice paddies (the Japanese adopted the practice later). 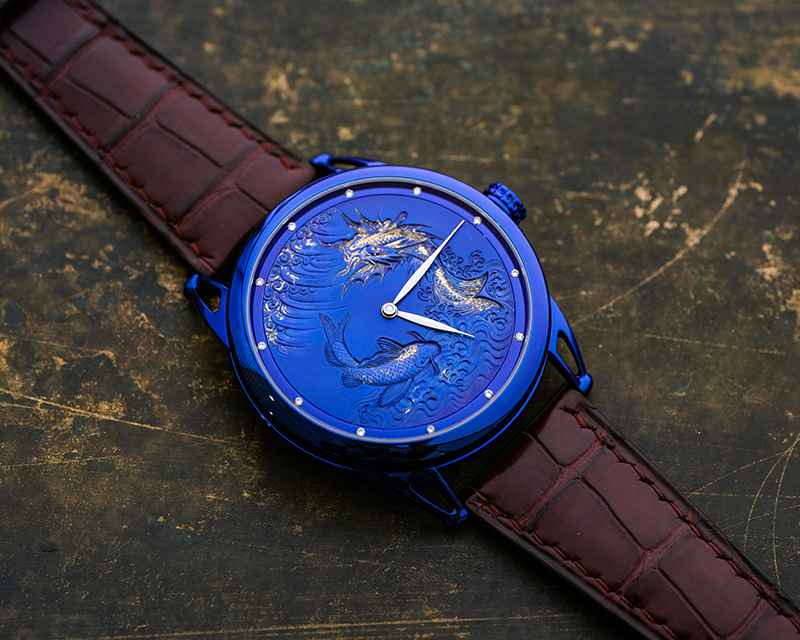 As such, found on the predominantly blue dial of the Maestri’Art II are a carp and a dragon, with the engraving deliberately made more polished when compared against the tsuba. Rendered in titanium with gold accents, the watch’s dial is also adorned with 12 diamond hour markers, and polished steel hour and minute hands. 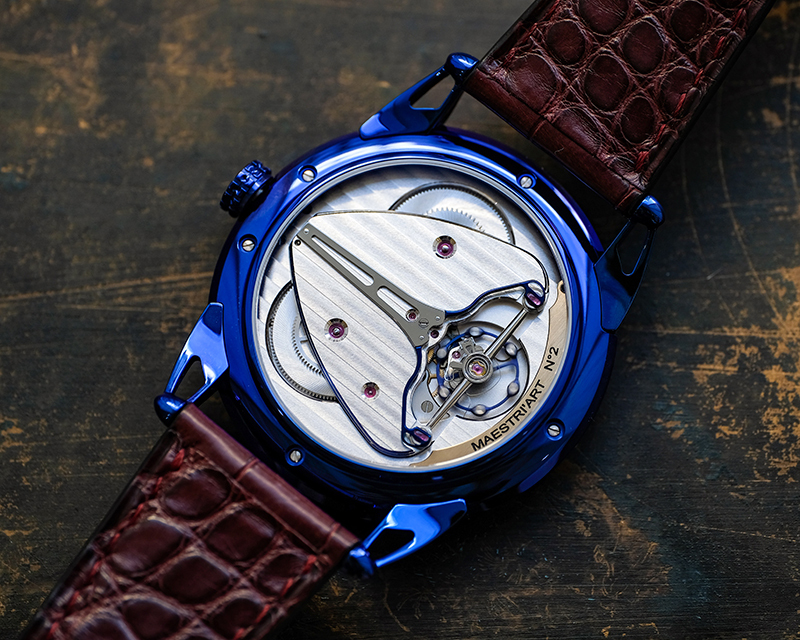 The 42-millimeter case that wraps over the dial is also finished in blue, grade 5 titanium. Visible through the sapphire crystal caseback is De Bethune’s hand-wound calibre DB2005, which has 27 jewels, ticks at 28,800vph, and can work for six days after a full crank. This movement is nicely decorated, too. 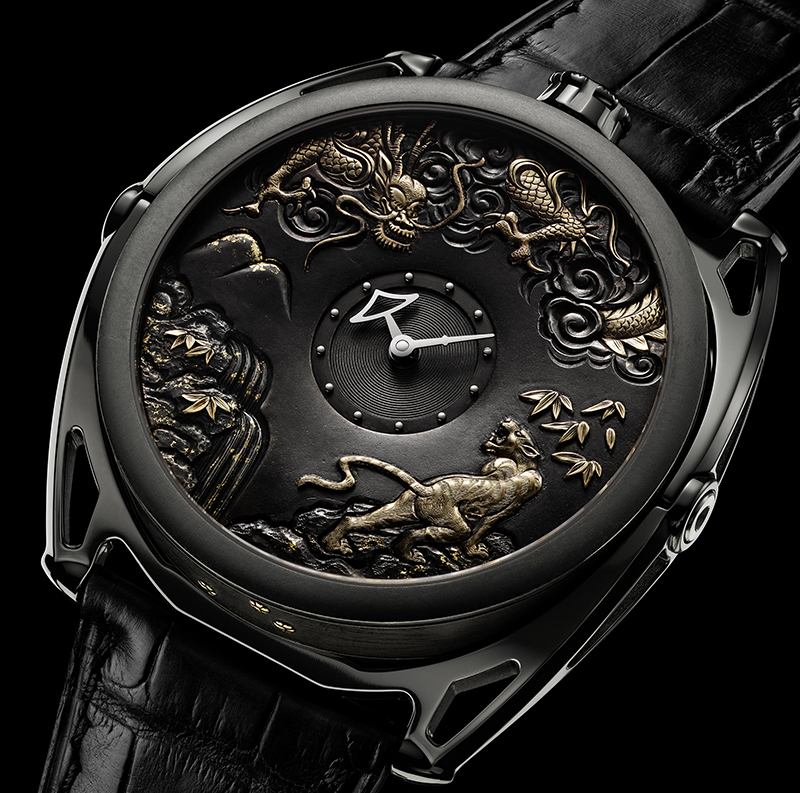 The artwork on both pieces in the new Maestri’Art Collection were done by master engraver Michele Rothen, whose ministrations have also graced the products of other luxury watchmakers. This time though, her gazed delightfully turned eastward.